// In real life, check for out-of-memory! The caller, after it is finished with the data, is responsible for freeing the data. The important thing to note is that the code doesn’t allocate memory with malloc, and doesn’t free it with free. 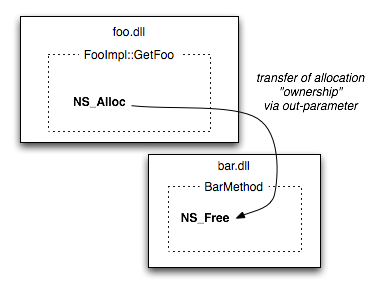 All memory that is passed across XPCOM boundaries must be allocated with NS_Alloc and freed with NS_Free. We have this rule because of mismatched allocators. Depending on your operating system and the position of the moon, each shared library may have its own malloc heap. If you malloc memory in one shared library and free it in a different library, the heap of each library may get corrupted and cause mysterious crashes. By forcing everyone to use the NS_Alloc/Free functions, we know that all code is using the same malloc heap. In most cases, there are helper functions which make following the rules much easier. On the implementation side, the ToNewUnicode and ToNewCString functions convert an existing nsAString/nsACString to an allocated raw buffer. It is especially important for extension authors to follow this advice on Windows. The Windows version of Firefox uses custom version of the Windows C runtime which we’ve patched to include the high-performance jemalloc allocator. Extension authors should link the C runtime statically, which guarantees that they will have a mismatched malloc/free heap. New code shouldn’t use “string” or “wstring” IDL types; use “AString” or “ACString” instead. See Choosing the right memory allocator on MDC. See the XPCOM string guide. What if this code looked a lot more like a Python import module statement? This code is more readable, and is slightly more efficient. We could do this now, for Mozilla 1.9, in a backwards-compatible way that didn’t require any code changes for existing code (i.e. createInstance() and getService() would continue to work as they do today). We already have XPCOM modules, which currently only implement the nsIModule interface. To make the above code a reality we’d only need to give the module an identifier so that it could be accessed by name, and teach the necko module to implement nsIIOService, with a little classinfo throw in for automatic interface flattening. With this technique, it is even be possible to load arbitrary files as XPCOM modules, without having to autoregister them in the global registry: extensionmodule = Components.loadModule(somefile). There is at least one problem with this approach: it means that extensions could no longer override the IOService contractID. Back when XPCOM was being copied from MS-COM, this was considered a major advantage. I don’t believe that it ever worked well, and there are much better ways to achieve extensibility, for classes that are specifically designed to be overridden. You are currently browing the archives of posts tagged with 'xpcom'.